I couldn't resist the orange ($29.80), which can easily double as maternity. It's lined so it's not too flimsy for hot summer commuting, and it has adjustable straps. 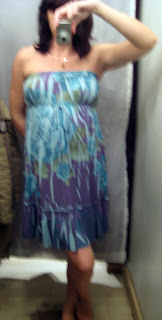 Big flowy dresses are a great way to get through humid sticky summers, preggers or not. The blue & purple strapless ($36) is another roomy and apt summer dress, good for weekends, and beaches, and weekend beach evenings....will summer never come? 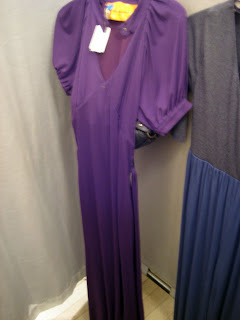 Then there are the long slinky dresses, etc, not very maternity, but very pretty. All of the below are from the F21 Twelve by Twelve line and can be found on the first floor, right side. 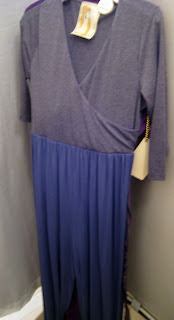 Long, dramatic-shoulder purple dress is $36, and the black dress is $39. The back of the belt is a chain, and there's a nice crochet detail on the bottom. The jumpsuits ($39) are available in different color combos. 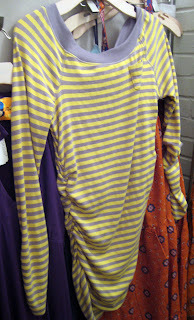 Slinky, striped "dress" ($28) is more of a top on me (long inseam). There may not be as many empire waist dresses as last spring, but there's still plenty of options here for the expectant mother. And as usual, F21 is packed with inexpensive dress options for everyone. But be sure to go to the 3rd floor on 34th Street, as this is where they keep the discounted items. I didn't have much time to browse the sale racks, but quickly spotted many tempting items from last season. Which, at F21, could have been last week. I REALLY hope you bought that strapless belted dress, lady. You're a KNOCKOUT in it! I think you've talked me into going back and getting it, Sal! Some nice finds! And great idea about the "maternity" clothes! I like that orange one! A bun in the oven won't deter you from wearing bit plastic heels and layered lengths of gold chain, I hope? Keep on pregnancy shopping!